One of Those IT Moments: Why won’t it work? If you are in IT, then you have probably had an experience like this. You have been trying to get something to work properly and no matter what you do, it just won’t work. You know (or are at least very sure) you have done everything you were supposed to and it still does not work. You finally give in and have someone else look at it. What happens? They figure it out within minutes. They find the one spelling or punctuation mistake, the check-box that should or should not be checked, or even the capitalization mistake. They notice the one thing you did not. Once you are done banging your head against the wall, you wonder how you could have missed that. It had been staring you in the face the whole time. I recently had another of those moments and I thought I would share that experience and others with you. I am sure many of you who are reading this have experienced these moments. I know I have had moments like this a few times in my career. The first time in my IT career I can remember it happening was back in college. I was in a programming class. I think the language was COBOL, so that should give you an idea how long ago I was in college. I had almost finished the assignment, but had one problem. The program gave the correct response, but then changed it. I had my buddy who was in the class with me look at it. For a short while, he was also stumped as to what was happening. After reviewing it together over and over, he finally looks at me and calls me a name that had a similar meaning to idiot, but not as nice. In the main body of the program, I had forgotten a period after the ‘Stop Run’ command. One little dot. Because it was not there, instead of the program ending where it should, the subroutine directly after the main body was run one extra time. Over 20 years later, I still remember that incident. That’s how frustrating (and revealing) it was. Last week, I was doing a VMWare server refresh with a client. We needed to swap out some host servers that were past their prime for some new servers with up-to-date hardware. On the first server we swapped out, we hit a point where the server seemed to be configured properly in vCenter, but would not talk to the SAN. I looked into the obvious areas first like cabling and configurations, but could not find anything. Admittedly, I found a couple of little things to adjust. However, there was nothing significant. I was looking at it going nuts knowing that it should work. My client was looking over my shoulder trying to see if he could catch something. I compared settings from new to old. I checked everything over and over. I changed settings I knew were correct, but had to try anyway. We finally gave up and called VMWare support to see if they could find it. The first support person knew right away that this was not his area of expertise and handed us off to someone else. That second person, took five minutes to find it. On the SAN, in the WWN name, the letters ESX were capitalized. In the host server’s configuration, they were lower case. That was it. We had been staring at it over and over and never saw it. It was past 2 am, so we were not likely to see it. Also, in my defense, I had copy/pasted the WWN from the SAN console to the VMWare console configuration. However, there it was. One of those moments where the answer was extremely simple, staring us in the face, and we were not going to see it. By the way, I observed what happened when we did the second host server replacement. I copy/pasted again and it did the same thing. On the paste, capital letters were converted to lowercase. The wise guys reading this are thinking: “Sure, that is your excuse.” However, we are replacing more hosts this week, so I can video it happening as proof. I am not saying that I am not losing my mind. I am, but this was not a symptom of that. Let’s face it, you don’t have to be in IT to have one of these moments. I remember helping my kids build LEGO sets. One of them could not figure out why they were unable to do what the directions show. I would look at it and realize that they had previously used a brick with three studs when they needed one of the exact same color and similar shape that had four studs. Ever try a video game where you just can’t figure out what to do next? You go on to the Internet and find a walk-through or watch a video showing you how to do that level only to realize that the answer was staring you in the face. You did not realize it was there, but it was. Like I said, we have all ‘been there, done that’. If you haven’t, think of this article when it does happen to you (and it will). It won’t help you feel less “stupid” at that moment, but you will know you are not alone. If you have any stories like this, feel free to share them in the comments of this blog. Here’s a neat little laptop troubleshooting tip for you! Is your laptop battery not charging? Are you getting a pop-up warning by your onscreen battery meter that you believe to be grossly exaggerated? Did your laptop keyboard suddenly stop working for no reason other than to give you an excuse to go home early? Hold power button in for 10 seconds WITHOUT the battery or charger plugged in. Turn over laptop again, reinstall battery, and plug power back in. Boot laptop. Check your battery meter again, or test whatever was ailing you. You’ll be surprised how many little annoying problems this fixes. Why does it work? I’m not sure. Something about discharging the motherboard, free radicals, or gremlins. Take your pick. Be sure to let us know how it worked for you. Solid State: When a good SSD goes bad. Until recently, I was really enjoying my SSD drive: Windows booted in about 20 seconds, programs opened immediately, copying large files was very quick. To be fair, I put a LOT of wear and tear on the drive between installing/uninstalling, testing new software and tools, Visio changes, and creating a few blog videos. Plus I would often use the drive to copy data from another failed drive to a new one. Then it happened: I was in the middle of a remote support session with a client when The Blue Screen of Death appeared. Embarrassed, I told the client I would call back in a few minutes. (Fortunately, I had a backup laptop, and was back to work in the time it took my old laptop to boot up.) Once the support call was complete and resolved, I set my attention on figuring out what went wrong with my primary work laptop. The laptop rebooted fine (sigh of relief.) I had run a backup of my laptop only three days before, so I felt confident that if this turned out to be a hardware problem, I would still be able to restore my data to another drive or to another PC. Regrettably, I did not get a chance to read the error message that was displayed in the BSOD – which is usually a big help. Next step was to review any windows updates that were recently installed, and try to remember if I had manually installed any new programs or attached any new devices. The only suspect I could find was a video driver update. Instead of uninstalling it, I used System Restore to go back to the day just before the update was installed. After restore, the laptop seemed to work fine for a few days. Then I started to notice a few problems: boot-ups were taking considerably longer, the system would hang if I had more than three programs open, and things just seemed to take longer: opening and saving documents, etc. I never saw another BSOD, but I was beginning to get nervous anyway. So I found my original hard drive, used a drive replicator to copy my SSD back to the old hard drive and swapped out the drives. Since then, I haven’t had any problems. Yes, the laptop runs slower with the old hard drive – but at least now it is stable and not failing. Though Murphy’s Law says that my laptop will crash as soon as I post this blog. I was aware that SSD’s have a limit to the number of times you can write to them, the OCZ Vector was a great SSD while it worked, and I plan to do some more testing on the drive/update firmware/call their support when I get time. All in all, I would say getting a good two years out of it is acceptable. But I am currently looking for a different brand. Let me know if you have any suggestions or questions. In part 1, we went over the installation process for a certificate. Now that we have our base certificate installed, we need to get the Intermediate certificate installed. Some certificate providers offer the ability to download your certificate, any Root certificate, and the Intermediate certificate in one bundle. For those providers, you will need to look up their instructions on how to utilize a bundle such as that. 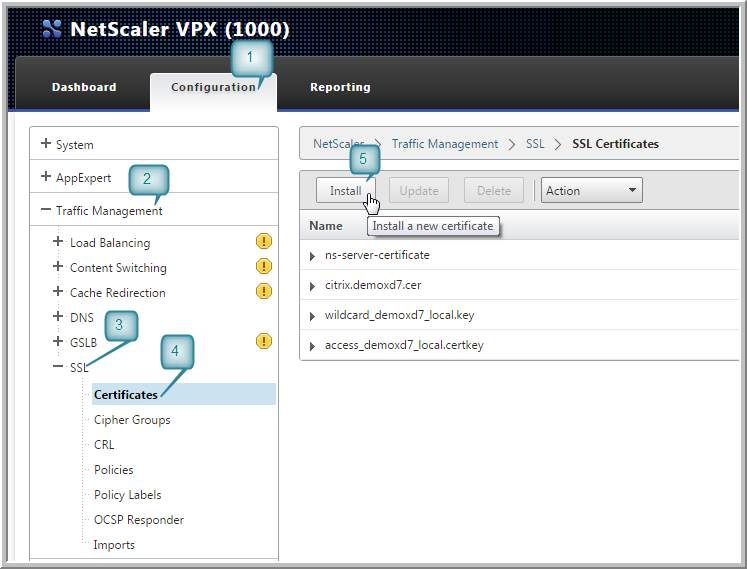 The NetScaler will work with certificate bundles and the results may be quicker. However, we are going to continue on as if you did not have the option for a certificate bundle and now need to install the Intermediate certificate. From the list of certificates shown, select the Intermediate certificate. That is all it takes. You can now check your certificate status with a certificate checker tool (the cert provider usually has one to utilize). You should not see any issues pertaining to an Intermediate certificate. Going back to the example given in a previous blog, you can now try to connect the devices that had issue connecting to the provided certificate alone. 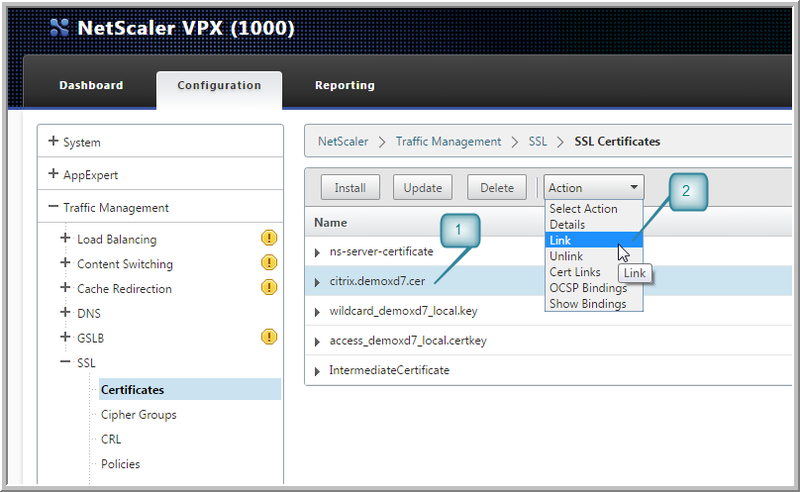 The example given in the blogs for installing a certificate and Intermediate certificate were shown through the GUI. The GUI is translated to command line syntax when it is executed. Therefore, if you would like, you can install certificates from a commend line. We will not go into detail on this procedure, but the basic command lines for it are ‘add ssl certkey’ and ‘link ssl certkey’. Look up those commands should you wish to do everything from command line. Please post your comments or questions below. You can also reach me directly by email. We have all seen all the different types of display adapters that can be used to connect a desktop or even a laptop to an external monitor. Some of us use them just to have a second or even third screen. Others just want to have a larger screen. But did you know there are different adapters? So what is the best adapter to use and what are the differences? The most widely known adapter is the VGA adapter. This is the blue adapter that’s probably the most familiar and still the most widely used connector for monitor connections. And that’s one of of its biggest pros. That means that may pieces of equipment still have these connectors and many users have the wires. Almost all projectors and monitors still have a built-in VGA connector. The wires are easy to find and can be found in just about any store, fairly cheaply. The cons of using VGA are these. Signal can easily degrade depending on distance, thickness of the VGA wire, and even when connecting to a digital piece of equipment. Since VGA is an analog signal, it does not convert to the newer digital stream that most new pieces of equipment use very well. The biggest drawback to me is that VGA is just not as clear or have as sharp of a picture as other connectors. The next adapter type is Display Port. There are two different versions of this type: single layer and dual layer. The biggest difference is that the dual layer is capable of a higher resolution. Dual layer is capable of 2560×1600 which is a nice improvement of the 2048×1536 maximum resolution of VGA. Other pros of DVI are that it can be used with either VGA or HDMI connectors to allow you to connect to devices that do not have the DVI connection. This makes DVI a very versatile connector. The cons are that they are larger connectors and like VGA, cannot carry audio or data. Finally they do not support as many colors as the newer adapters below. The third connector type is HDMI. The older standard of 1.4 brought many things to the table over DVI. It is able to carry audio and data across the wire, supports a wide range of colors and video formats, and even supports 4K resolution. Most modern equipment has this type of connector and it is very easy to add to desktops. The cons are that there is no locking mechanism, it does not support very high aspect ratios, and cannot handle multiple streams at once. The newer 2.0 version fixes all of that but the locking mechanism. The final adapter type is Display Port. This is probably the best connector due to the fact that it has the most pros. The pros include: a locking mechanism, it can be converted to all other formats and adapters, it supports 4K resolution, is capable of audio and data transfer, multiple video streams, and large aspect ratios. There really are no drawbacks that are worth mentioning when talking about connecting a computer to a monitor. These connectors are easy to add to desktops and the wires are not expensive. Overall a great choice when it comes to a display adapter. So what are the best connectors to purchase? I suggest either HDMI, since everything new has it or Display Port since they are such great connectors. But keep in mind that they are both digital connectors and you really will not see a difference in quality. It just comes down to what connector type is available to you and which is easiest to use. I hope this helps to shed some light on the differences between display adapters. As always, please post your comments and questions below or email me directly. Windows Server 2003 was like XP. Everyone loved it and never wanted to move off of it. And just like XP, the time is coming quickly where you will need to move away from the much loved server or become vulnerable to threats very quickly. Once support has ended for Windows Server 2003 there will be no more security patches, but the threats will still be there. One of the most common systems that I see on Windows Server 2003 these days is Active Directory. That tends to be true since moving Active Directory can be a long and tedious process. It can also cause numerous issues along the way. Below is a basic guide on upgrading your Windows Server 2003 Active Directory to Windows Server 2012 R2. I would not recommend doing this on your own. This is something that takes planning and careful consideration. Projects like this are where companies such as Custom Systems are a perfect choice. In case you were not aware, End of Life (EOL) for support of Windows Server 2003 is currently slated for July 14, 2015. That date is fast approaching and will be here before you know it. Make sure to plan for these upgrades with ample time to complete them. I will not get into what Active Directory is and what it does, as it provides authentication and authorization services as well as a framework for other related services that can be deployed. The below guide is only a reference and should not be considered the perfect solution for all upgrades. Each upgrade will differ and will require extensive planning. This guide assumes that you have a 2012 R2 server installed as well as have installed the Active Directory role. Again this guide is not to be followed without proper planning and assistance. Open the Active Directory Users and Computers console on your new Windows Server 2012 R2 computer. Right click your domain and select Operations Masters in the sub menu. In the Operations Masters window, ensure the RID tab is selected. Select yes when asked about transferring the Operations Master role. Once the Operations Master role has successfully transferred, click OK to continue. Ensure the Operations Master box now shows your new 2012 R2 Windows Server. Repeat steps 4 to 6 for the PDC and Infrastructure tabs. Once completed, click Close to close the Operations Masters window. Close the Active Directory Users and Computers window. 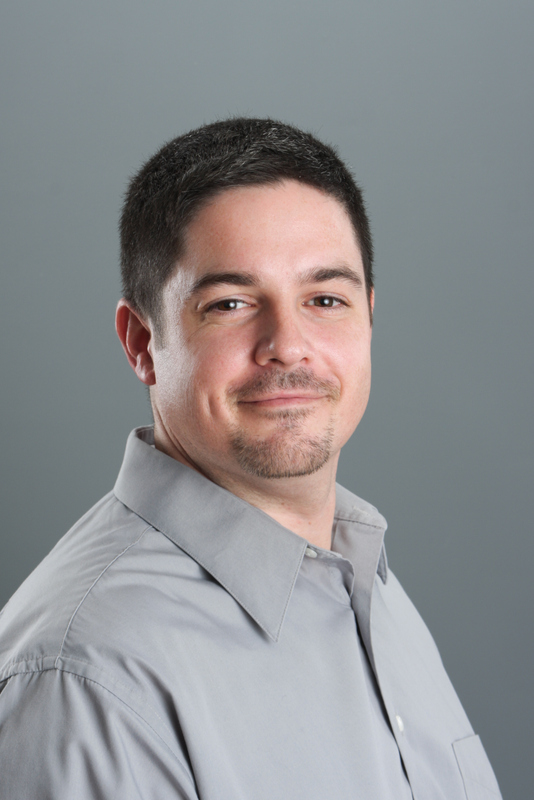 Open the Active Directory Domains and Trusts console on your new Windows Server 2012 R2 computer. 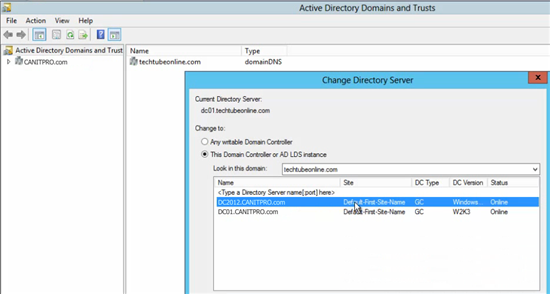 Right click your domain and select Change Active Directory Domain Controller… in the sub menu. In the Change Directory Server window, select This Domain Controller or AD LDS instance. Select your new 2012 R2 Windows Server. Back in the Active Directory Domains and Trusts window, hover over the Active Directory Domains and Trusts found in the folder tree on the left hand side to ensure the server now reflects your new 2012 R2 Windows server. Right click Active Directory Domains and Trusts found in the folder tree and select Operations Manager… in the sub menu. 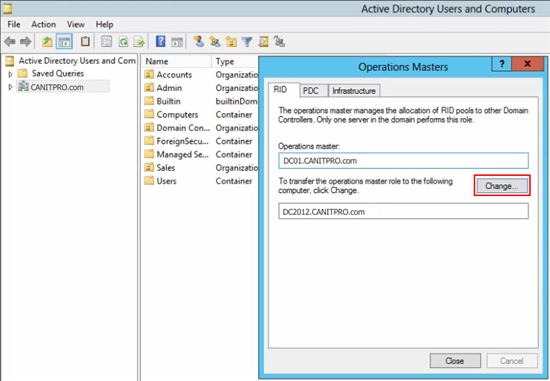 In the Operations Master window, click Change to transfer the domain naming master role to the 2012 R2 Windows Server. When asked if you are sure you wish to transfer the operations master role to a different computer, click yes. Once the operations master is successfully transferred, click OK to continue. Click Close to close the Operations Master window. Close the Active Directory Domains and Trusts console. 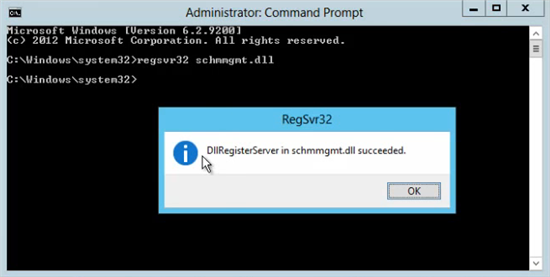 Open a command prompt in administration view on your new Windows Server 2012 R2 computer. On the command prompt window, enter regsvr32 schmmgmt.dll and hit enter. Once completed successfully, click OK to close the RegSvr32 window. Open a MMC console on your new Windows Server 2012 R2 computer. 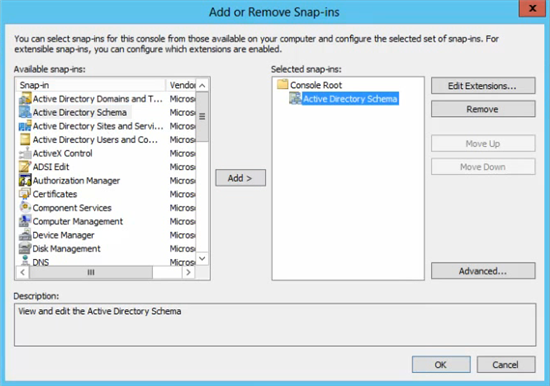 In the Add or Remove Snap-ins window, select Active Directory Schema and click the Add > button. In the same MMC console, right click Active Directory Schema and select Change Active Directory Domain Controller… in the sub menu. A warning will appear stating that the Active Directory Schema snap-in in not connected. Click OK to continue. Hover over the Active Directory Schema folder in the folder tree to ensure the new Windows Server 2012 R2 computer is shown. Now right click Active Directory Schema and select Operations Master… in the sub menu. In the Change Schema Master window, click Change to transfer the schema master role to the 2012 R2 Windows Server. When asked if you are sure you wish to transfer the schema master role to a different computer, click yes. Once the schema master is successfully transferred, click OK to continue. Click Close to close the Change Schema Master window. In the MMC, click File > Exit. When asked to save the console, click No. Once completed, open the Active Directory Users and Computers console to verify that the Active Directory database successfully replicated to your new Windows Server 2012 R2 computer. Be aware that the database replication may take some time depending on the number of objects in Active Directory. 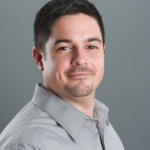 Open Active Directory Sites and Services on your new Windows Server 2012 R2 computer. Expand the Sites folder, then the Default-First-Site-Name folder, then the Servers folder. Expand both listed servers. 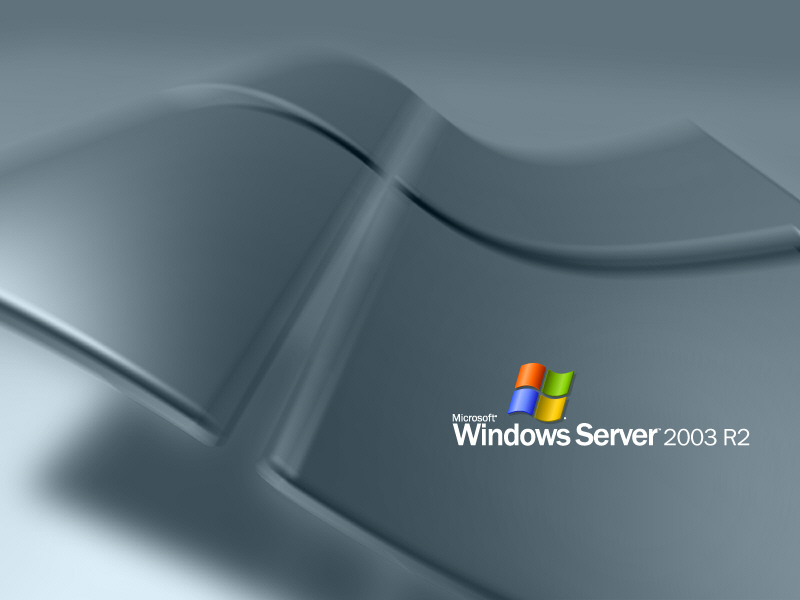 One should be your new Windows Server 2012 R2 and one should be your Windows Server 2003. Right click NTDS Settings found under your old 2003 Windows Server. In the sub menu, select Properties. Under the General Tab, unselect Global Catalog and then click the Apply button. Close the Active Directory Sites and Services window. Verify that your new 2012 R2 Windows Server is running the FSMO role by opening the command prompt in Administrative view and running the following command: Netdom query fsmo. In the Network and Sharing Center, be sure to change the Preferred DNS server to match the Alternate DNS server, then delete the IP address listed under the Alternate DNS server should it currently be pointed to the old 2003 Windows Server. All that’s left is to demote the old 2003 Windows server by first adding the new 2012 R2 Windows Server as the Primary DNS, followed by running DCPROMO (which is deprecated in Server 2012) to demote the old 2003 Windows server. As I stated earlier, this is a basic guide to help you understand what to expect during a Windows Server upgrade. As always, please post your comments and questions below or email me directly. Know your storage devices before buying something “just as good”. One objection we typically hear from potential clients is why vendor X costs more than vendor Y for the same features and specifications. 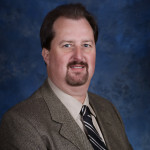 Today, it is not uncommon in the storage market (SANs and NAS) to know that that you are buying more than specs and need to look more in-depth when you find a low-cost alternative for a technology that previously was considered too expensive for your organization. My recent client experience exemplifies this problem. The storage needs have grown over the past several years and exceeded their file server capacity. Their business requires the long-term retention of image files for every device they manufacture and the repository is approaching 25 years-old. Many of these image files may never be retrieved unless a customer requests them or engineering is researching a design or manufacturing defect. Their daily requirement is to capture high-resolution images of their products and continuously store them as they are prepared for final shipment. The annual IT budget planning always includes a small SAN for the long term storage and daily storage of these important image files. However, the first item to typically be removed from the budget is the SAN due to what is considered the high cost of the product. Last year this changed, with the introduction of a low-cost, high-value storage device from Buffalo Technology. Who would not want an 8TB rack mount iSCSI RAID5 storage device for $2500 that is “just as good” as small iSCSI SAN for $15,000? 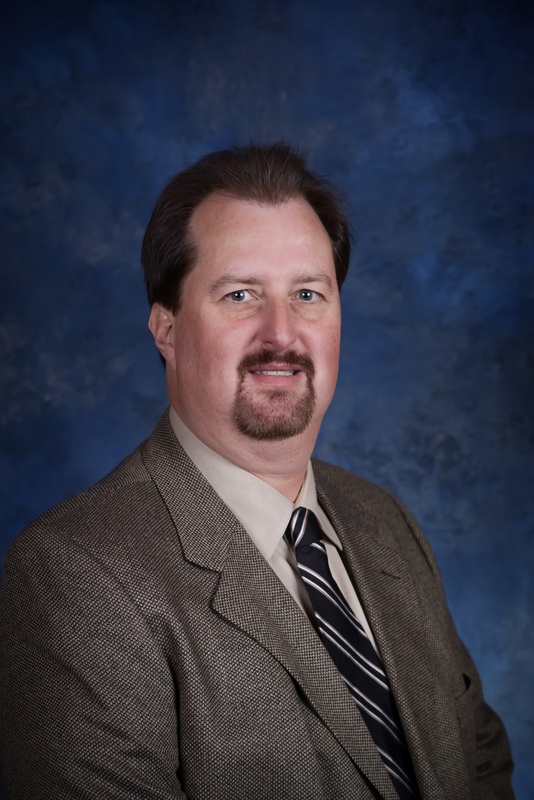 The IT budget could surely accommodate such a low-cost, high-value item. The first year was uneventful and the device performed as advertised. Recently, the device configured with four 2TB SATA drives indicated a drive failure in Slot1. This should not be a problem, as we all know RAID5 will keep running with a single failed drive. A call to Buffalo Technology and the completion of some basic troubleshooting confirmed the problem. A new hard drive replaced under warranty would solve the problem. After jumping through several hoops, chasing confirmation emails, faxing in receipts and paying $100 for an advance replacement my new drive showed up six days later. Yes, I could have paid more for next-day shipping, after the receipt was faxed in, validated by customer service, and payment was submitted to their website. I suspect next-day shipping would still require at least three to four days for the drive to show up. The instructions delivered with the drive were minimal at best. Update firmware on the device, and insert the new drive. Why would I want to update firmware on an iSCSI storage device that already has a failed hard drive is not something I want to risk and potentially lose all the data? Things happen in IT we all can attest to. The new drive was inserted, the red LED started to blink and I waited, and waited, and it appeared to be rebuilding the array. I came back after a weekend and it was still blinking. I could not see progress on the rebuild and the product manual gave no indication of the actual process, but being an IT professional I have worked with many RAID5 storage devices that when a failed drive is detected and removed, and a new drive is inserted it just starts rebuilding and your done after several hours. Not this device, a call to support confirms that you need to go into the web interface, detect the new drive, and then select some menu items to initiate the rebuild.That did not go as planned, and support had to check with a more knowledgeable resource. After a brief wait on the phone I was told to dismount the iSCSI storage device and start the rebuild again. I responded that dismounting the iSCSI device would take my storage offline and make in unavailable to my network of users. Why would this be a requirement for a RAID5 iSCSI storage device used by business? I followed their recommendations and then discovered it would be 33 hours for the array to rebuild with the new drive. I now had a client that was not happy that their RAID5 iSCSI storage device that was “just as good” as a more expensive iSCSI SAN would require them to stop using it for 33 hours while the array was rebuilt. The final outcome was that the unit was restored and all data stayed intact, however, the experience with a product that was “just as good” was much less than expected. I suppose when you read this title you might assume it would be about all the time you will get to spend tinkering and exploring your latest Father’s Day gadget. I wish that was true. Since I have been involved in IT for 20 years I can tell you I really wish this was the case. From my perspective, I think about how many family gatherings involve an in depth discussion of what I do for a living, Then, when I actually tell them, most people get glazed-over looks after about 30 seconds, and immediately shift the conversation to a personal story about their latest challenge with their own situation and technology. How do I get this picture on my iPad? Why do I have multiple contacts for the same person in my iPhone? Why do I get so much SPAM? I have a new (fill in the blank with you device name) and it won’t stay connected to my home Wi-Fi. How do I get rid of all these pop-up advertisements on my computer? Do I need to buy a new PC and how much should I spend? I have a suggestion for this day only: moms, it’s time to give the IT Dad the day off. How about stepping in when you see Dad cornered, watching the food on the grill burn because someone has whipped out their smartphone and is asking a million questions? No one likes burnt food or to have their special day consumed, answering an endless queue of personal support requests. Moms should immediately start talking about things that Tech Support Seekers do not really care about and save the day for Dad. Mention those new kitchen curtains, or how you still have not picked out a new paint color for the powder room. If these do not work, you can always ask your own question, guaranteed to drive any free tech support inquisitor away… Can you give me a hand in the kitchen? Most Dads I know like me, are more than willing to help out a family member, friend, or neighbor when they have a technology woe. But not on Father’s Day. Let’s not make Father’s Day for the IT professional a Free Personal Support Day; give Dad the time to enjoy his one day a year off. Of course, it’s back to the help desk on Monday.